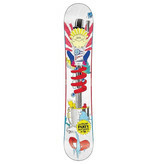 Maybe because this board won the DewTour Slopestyle Championship? Or maybe you prefer the X-games silver medal? Hmmm... Or, because of the Transworld Snowboarding TopTen Good Wood award for one of the best freestyle boards on the market? In any case, the EXTREMES are for a special customer looking for a unique product that not everyone else is going to have. They're geared toward a progressive park shredder that doesn't want to break the bank, but is looking for more performance than the standard Stairmaster construction. They feature an epoxy glass configuration, sintered base, and cambered construction so they're fast, strong, and have mad pop off park jumps. Combine that with a specially designed dampening system placed along the edge between the inserts, and these boards yield enhanced impact resistance as well. The performance in relation to price tag of these versatile freestyle boards is unmatched, and as a result, they're the first ones to sell out every year.